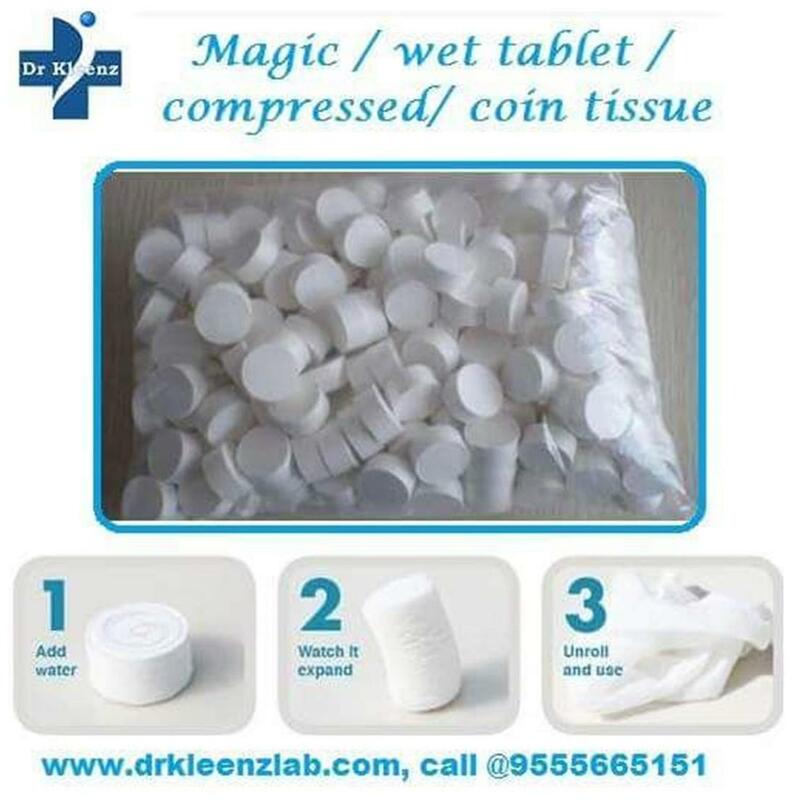 Compressed/ Magic Napkin/ Coin Tissue Magic Napkin supplied in a shape of coin; is just like a piece of soft cloth, made from 100% natural pulp. It is degradable and environmental friendly, durable, very soft and hygienic product. As it is fully compressed so it has least chances of developing any germs or fungus or unpleasant smell. How to Use: Just pour some water, in small quantity, on the Magic Napkin and you can see it growing it in full size immediately. You just have to unfold and enjoy it. Depending on your need you can use hot or cold water for desirable temperature of tissue Application and Usage: 1. Places where health and hygiene are extremely important (restaurant, hotels, hospitals, Salon, Schools, Conference rooms etc.) 2. Removing makeup and as nail polish remover. 3. During traveling and activities like Trekking, Mountain climbing, Golf etc. where weight and volume is an issue. 4. Ideal product for home, office, restaurants, hospitals, schools, picnic, camping, travel, promotion gifts, etc. 5. For babies and kids: hygiene usage Advantages of Magic Napkin are as follows: 1. It is innovative and hence also named as Magic Tissue . 2. It is safe for all skin types. 3. It is made of 100% natural pulp and hence is degradable and environmental friendly: 4. Compressed size like a coin or tablet and hence easy and convenient to store and carry. 5. Both type of water (hot & cold) can be used to control the temperature of tissue. 6. You can further use perfume or scented water on the coin tissue to get desired results.